Exploring ways to find the “sweet spot” in collaborating with others is a particularly salient topic in the current political climate. Thomas Kilmann’s model is an excellent guide on how to do this, which we illustrate in RiverRhee’s training on Assertiveness, and in our management training on Dealing with Difficult Situations, with a story about two sisters sharing their last orange. Thomas Kilmann’s model teaches us about the importance of having open conversations, and of deploying our best listening skills to understand what is most important to the other person. The idea is to find some common ground which may lead to a solution (the “sweet spot”) that might be even better than mere compromise. In the case of the sisters, they discover that they want the orange for different purposes, and so are able to share it in a way that meets both their needs – the zest for one, the juice for the other. The story about the orange is of course extremely simple compared to some of the issues facing us today, and especially where there are more than two people involved! However, the principles may still be relevant. So it was with great interest that I read Lisa B. Kwan’s article in the March-April 2019 issue of Harvard Business Review on “The Collaboration Blind Spot”, pp.67-73. The author explores what can happen in cross-group initiatives, and how to address the defensive behaviours that might arise. Lisa Kwan reminds us that if we are seeing or experiencing defensive behaviour between groups, the chances are that they are feeling threatened in some way. Lisa Kwan categorises the threats that lead to this defensive behaviour under three fairly closely related headings, the first of which is identity. A group may feel that there is a threat to their on-going ‘reason for being’ as a result of the collaboration. Will their role disappear? If appropriate, the leader could also grant the individual groups greater ownership of roles not associated with the collaboration in question. This threat is to do with the groups’ and the parent organisation’s perception of the value that they bring. A collaborative initiative may threaten a group’s sense of control, decision-making or autonomy. Identifying the broad topics, processes, products, services, equipment etc. and general decisions involved. Lisa Kwan’s article represents the results of eight years of research, including six years of doctoral research. She has observed cross-group collaboration in global companies, and conducted extensive interviews. Her conclusions certainly resonate with what I have more informally observed and I think provide invaluable insight for leaders, as well as for individuals involved in conflict situations. Lisa Kwan suggests that leaders should “check for their blind spots” when asking groups to collaborate to pick up and act upon the potential behavioural risks involved. I believe that her advice could help both leaders and individuals find the “sweet spot” for collaboration! Elisabeth Goodman is the Owner and Principal Consultant at RiverRhee Consulting., a consultancy that specialises in “creating exceptional managers and teams”, with a focus on the Life Sciences. (We support our clients through courses, workshops and personal one-to-one coaching.) Elisabeth founded RiverRhee Consulting in 2009, and prior to that had 25+ years’ experience in the Pharmaceutical Industry in line management and internal training and consultancy roles supporting Information Management and other business teams on a global basis. RiverRhee is a member-to-member training provider for One Nucleus. Elisabeth is accredited in Change Management, in Lean Sigma, in Belbin Team Roles, MBTI (Myers Briggs Type Indicator) and is an NLP (NeuroLinguistic Programming) Practitioner. She is a member of CILIP (Chartered Institute for Library and Information Professionals) and of APM (Association for Project Management) in which she was a founding member of the Enabling Change SIG. The March-April 2019 issue of Harvard Business Review features an article by Mihnea Moldoveanu and Das Narayandas on “The future of leadership development” (pp. 40-48). The article focuses on the need to build “personal learning clouds”(PLCs) that embrace remote learning platforms to compensate for the shortfalls of more traditional forms of face-to-face training. There is no doubt that those shortfalls do exist, and that MOOCs (massive open online courses) and other forms of online learning platforms (see notes) can help to address them as part of an individual’s PLC. However, at RiverRhee , we are still experiencing a growing demand for our face-to-face courses. So I thought it might be helpful to the HR contacts, senior leaders and delegates that we work with to reflect on how to make any form of training in their “personal learning clouds” as effective as possible. Here then are my thoughts on some potential ways to address the shortfalls identified by Moldoveanu and Narayandas. The authors highlight the fact that organisations don’t always benefit as much from any learning intervention as the individual does. We always ask individuals to reflect, before our courses, on their learning objectives or expectations from the training. HR and other senior managers could help to anchor individuals’ learning to the goals of the organisation by discussing these goals with individuals before they identify and take part in specific learning interventions. This reminds me of a previous HBR article which my colleague Liz Mercer wrote up as a blog: “Why leadership training fails..” This article also highlighted the leadership team’s responsibility for articulating the organisation’s strategic goals and how talent development should be linked to it. Gaining organisational value from investing in learning was also the theme of a RiverRhee newsletter in June 2017 which featured a CIPD report “Driving the New Learning Organisation”. Given that HR and other senior managers, and the individuals concerned, can indeed choose what form of training interventions they use, why not make sure that these reflect requirements as closely as possible? This should be possible for online as well as face-to-face courses. After all, time and money are involved, so it’s important to make sure that these are well spent. Moldoveanu and Narayandas highlight that one of the problems of traditional executive learning programmes is that they focus on such things as strategy development and financial analysis. They argue that this creates a real gap in terms of the “interpersonal skills essential in thriving in today’s flat, networked, increasingly collaborative organizations”. What is more, these leadership skills are needed by employees across the board, not just at the very top levels of the organisation. These are skills that are receiving growing attention in RiverRhee’s offerings, both within our supervisor, management and leadership courses, and as stand-alone offerings in courses on communication and assertiveness. And, we get a tremendous buzz when we know that what we are offering has really ‘hit the spot’. So talk to us, and other training providers like us, to make sure that what we deliver really does meet your requirements. The HBR authors quote the results of a century of research into cognitive, educational and applied psychology, and more recent work on the neuroscience of learning. Time. New learning is easily forgotten unless it is applied straight-away. Make sure the learning happens as close to the time as it will be applied as possible. Space. Whilst attending a course away from the place of work can help minimise distractions, it might also create a barrier to applying the learning. Weight one against the other for the learning required. Other learners. If the other learners that the individual is interacting with are doing similar work, then that will better support an effective exchange and development of knowledge. Subject matter. Learning interventions that include case studies and discussion that are related to the individual’s area of work will also reinforce their learning. We ask delegates to commit to how they will apply their learning, and, in most cases, follow-up with a mini-coaching session about 4 weeks after the course to see how they have got on. Most of our training takes place within a very tight geographical location in the UK, and our one-to-one coaching is mostly delivered ‘in situ’. It would be interesting to see whether travelling to courses from elsewhere in the UK, and from other countries, has had a negative impact on our delegates’ learning. Our open courses brings delegates together from related industries and/or disciplines. Our in-house courses make that connection even more robust. How could you, if you are an HR practitioner or other senior manager responsible for identifying training interventions, ensure that individual’s “personal learning clouds” are as close to ‘real life’ as possible? If an individual’s development goals have been clearly defined before any learning intervention, then it should be possible to measure return on investment, to demonstrate value, and to provide feedback for continuous improvement. Whilst levels 1 and 2 can, to a certain extent, be determined immediately after the learning intervention, levels 3 and 4 will come some time after. RiverRhee’s follow-up 4 weeks later will help to obtain this feedback. It is up to those responsible for an organisation’s learning and development programme to routinely collect and make use of information on the effectiveness of individuals’ “personal learning clouds” – both online and face-to-face. There is a wealth of useful information in the HBR article on accessing online resources as part of an effective “personal learning cloud” for leadership development. However, those organisations and individuals that still want to make use of face-to-face learning interventions, can also benefit from just a few tips to make those interventions more effective. Platforms and other resources for a “personal learning cloud” identified in the HBR article include Coursera, edX, 2U, LinkedIn Learning, Skillsoft, Degreed, Salesforce Trailhead, McKinsey Solutions, McKinsey Academy, BCG Enablement, DigitalBCG, SmashFly, Yello, Phenom People). Elisabeth Goodman is the Owner and Principal Consultant at RiverRhee Consulting., a consultancy that specialises in “creating exceptional managers and teams”, with a focus on the Life Sciences. (We support our clients through courses, workshops and personal one-to-one coaching.) Elisabeth founded RiverRhee Consulting in 2009, and prior to that had 25+ years’ experience in the Pharmaceutical Industry in line management and internal training and consultancy roles supporting Information Management and other business teams on a global basis. RiverRhee is a member-to-member training provider for One Nucleus and a CPD provider for CILIP (Chartered Institute for Library and Information Professionals). Elisabeth is accredited in Change Management, in Lean Sigma, in Belbin Team Roles, MBTI (Myers Briggs Type Indicator) and is an NLP (NeuroLinguistic Programming) Practitioner. She is a member of CILIP and of APM (Association for Project Management) in which she was a founding member of the Enabling Change SIG. How to give ‘negative’ feedback is one of the most frequent questions posed by delegates on RiverRhee’s management courses. It’s a topic we get into during our course on Performance Management and Development too. And it’s a question that arises when we explore the difference between coaching and mentoring. Marcus Buckingham and Ashley Goodall’s article “The Feedback Fallacy” in the March-April 2019 issue of Harvard Business Review (pages 92-101) is a gold-mine of information on this subject. And by the way, it also reminds us about why ‘positive’ feedback is so important, with fabulous guidance on how to do that well too. Traditional approaches to feedback rely on three fallacies which Buckingham and Goodall masterfully dispel through the use of analogies and neuroscience research results. Our new managers are often uncomfortable about giving feedback. Although their reasons for feeling so may vary, the HBR authors assert that we are not necessarily the best judge of what constitutes ‘good’ or ‘the right’ performance. They point out that we will each have a different perspective of this – they call this the “idiosyncratic rater effect”. The analogy they use is how different people will rate the redness of a rose – asking more people will only create more diversity in the interpretation of the truth of that redness! Instead, the authors suggest that people are better at assessing their own performance (as they would assess their own level of post-operative pain). In this situation, as Buckingham and Goodall say: “all we can do – and it’s not nothing – is share our own feelings and experiences”. The authors confirm something that we know from the field of Appreciative Enquiry: that people will learn (most) effectively if they build on strengths and what’s working well, rather than on weaknesses and what isn’t working well! Our brains build far more neurons and synaptic connections where we already have more of them i.e. in our areas of strength, than in our areas of weakness. When we focus on areas that we need to correct, our sympathetic “fight or flight” survival system kicks in and actually impairs learning. When we focus on dreams and how to achieve them, our parasympathetic or “rest and digest” system is stimulated and fosters openness to learning. This reinforces the need for managers to draw individuals’ attention to their strengths and explore with them how they might develop these strengths further. This is perhaps the most exciting of the authors’ three theories. They point out, again with analogies, from comedians, and sports, that each person’s example of excellence is unique: no two people will excel in the same way. The trick then is to help individuals recognise their moments of excellence, and how they can top up their learning to make these repeatable. The authors call this a “highest priority interrupt”. And by the way, the authors explain how studying failure and how to avoid it will help to plug gaps in performance and fix flaws, but is unlikely to lead to excellence! The observations in this article reinforce our approach to coaching: that it’s about creating the conditions and asking the open questions that will help the individual build on their strengths, further their learning, and excel. Then get them thinking about the past: what example can they think about of when they tackled something similar that worked well – what they did or felt. Then focus on the future – what do they already know that they could do; “What would you like to have happen” (an example of clean questioning). There is still a need to give instruction and feedback on aspects of work where there is a need to do things in a certain way – for health and safety or otherwise critical steps. This is more like mentoring. And we can also share how we would do something, but this will only be a starting point for an individual’s reflection. About the author. Elisabeth Goodman is the Owner and Principal Consultant at RiverRhee Consulting., a consultancy that specialises in “creating exceptional managers and teams”, with a focus on the Life Sciences. (We support our clients through courses, workshops and personal one-to-one coaching.) Elisabeth founded RiverRhee Consulting in 2009, and prior to that had 25+ years’ experience in the Pharmaceutical Industry in line management and internal training and consultancy roles supporting Information Management and other business teams on a global basis. RiverRhee is a member-to-member training provider for One Nucleus and a CPD provider for CILIP (Chartered Institute for Library and Information Professionals). Each booklet has provided me with some terrific insights, and ones that we have also endeavoured to share in RiverRhee’s courses for managers, leaders and individual team members. I wrote previously, in a RiverRhee newsletter, about some characteristics of inspirational leadership based on a book of that title by Claudio Feser. Feser suggested that the basis of this type of leadership is to have a strong focus on the goal to be achieved, to influence people in such as way that they are committed towards a course of action, and to encourage and support them to take ownership for their actions. We know from the work of Dan Pink and many others that having a clear sense of ‘why’ we are doing something is a great motivator. Goleman cites an example of Medtronic, which makes medical devices, inviting patients in to talk about how their devices had saved their lives. I had a similar experience when working at GSK where our Chief Medical Officer interviewed patients or their carers in the auditorium to give us an insight on how our work could make a difference to their lives. The people working in the small and medium sized Life Science organisations that we work with often have a clear vision of what their organisations want to achieve. And they have a passion for that. Leaders who can keep that vision and passion alive, and articulate it clearly and with conviction, will be more effective than others. As Annie McKee points out, it is all too easy to lose touch of what she calls “the noble purpose” of an organisation. It can become buried by short-term goals and pressures. The larger the organisation, the easier it is for this to happen. Take some time out, as a leadership team, to reflect and reconnect with a joint sense of purpose. Initiate discussions throughout the organisation to help everyone reconnect. This means connecting at an emotional level with what is important to you, and with what is important to the people that you work with. It requires not only self-awareness, but the ability to truly listen and observe. In fact, as Matthew Lippincott says, inspirational leadership requires all four parts of the authors’ emotional intelligence model: self-awareness, self-management, social awareness and relationship management. Claudio Fernández-Aráoz takes us through his own, and a Japanese female manager’s journeys into becoming inspirational leaders. He suggests that individuals need to start with some underlying potential, and then have “a combination of best practices for development and the right partner for your change process”. In the case of the Japanese manager’s case study, the underlying potential seemed to be a combination of curiosity, insight, engagement and determination. Mette Miriam Boell reminds us that leaders can be found at every level of the organisation – not just at the top. She also reminds us that the Latin origins of to inspire (inspirare) is “to breathe life into”. So that an inspirational leader is able to share their vision in such a way that it is owned by everyone in an organisation, so that they too become leaders, and so that the vision becomes a collective aspiration. Boell tells us that for a leader to do this requires a certain humility, a willingness to step aside and make room for others to step up to leadership, and a courageous openness to the unknown and the uncertainty that might result from this. Matthew Lippincott adds integrity and vulnerabity to the list. Also an active interest in the personal and professional wellbeing, and in the development of others (both technical skills and personal growth). Fernández-Aráoz’s case study of the Japanese manager showed how giving her the opportunity to lead strategic initiatives, combined with leadership training and support from a mentor was instrumental to her development as an inspirational leader. Do you have the qualities and the opportunities to become an inspirational leader? How are you, and how could you develop others to become inspirational leaders within your organisation? Harvard Business Review has come up with another insightful article on what makes for effective leadership. We know that creativity and innovation are the life-blood of many organisations, and that is certainly the case with the many Life Science organisations that RiverRhee works with. We also know that some individuals excel in creativity and that this strength can come as a package with some ‘allowable weaknesses’ – as recognised for example for the “Plants”, “Specialists” and “Resource Investigators” described in Belbin Team Roles. These allowable weaknesses can include such things as losing touch with reality or with the bigger picture, or not following-up adequately with others on things that have been discussed. Rob Goffee and Gareth Jones book ‘Clever. Leading your smartest, most creative people’ also has some great insights on the challenges that leaders might experience with their staff. They cite such things as having a low threshold for anything that might appear bureaucratic, and a desire to continue to pursue ideas beyond what is economically practical. (See previous blog: Why conventional knowledge management, process improvement and project management won’t work with ‘clever’ teams. Or will they?). 1. Tolerate failure (of course), but expect learning as a result. With innovation comes experimentation and failure – it is one of our greatest sources of learning. Leaders should clearly articulate this expectation of competence: zero tolerance for wasting time or money on activities that could have been avoided by applying learning from previous experience. Pisano adds some interesting qualifiers to balance against this: tolerance for people making mistakes vs. permissiveness; and demanding high performance standards in a way that demonstrates respect for employees’ dignity. 2. Expect a highly disciplined approach to experimentation. A highly disciplined approach includes a clear definition of what a project will be assessing and how, agreed go / no go decision criteria and consistent follow-through based on the results. Pisano cites a Cambridge Massachusetts company, Flagship Pioneering, that achieves this by designing experiments to expose the flaws in their ideas, rather than to validate the ideas. Their experiments are designed within limited budgets and timescales so that they can fail fast and cheaply. Negative results are celebrated as an opportunity to kill a project or reformulate it. There is no financial incentive for prolonging an unsuccessful project. 3. Cultivate a culture of candid debate and constructive criticism. Pisaro suggests there might be some cultural diversity in people’s level of comfort with giving and receiving constructive criticism on ideas; that mis-guided concepts of ‘niceness’ or ‘politeness’ might get in the way of candid debate. However, it is actually more respectful of an individual to expect them to defend their ideas and proposals and to engage in an open dialogue with them. We owe this level of two-way communication to each other, and in order to be effective and efficient in our work. 4. Expect individuals to take ownership in their areas of expertise. A principle we teach on RiverRhee’s management courses is that teams are more likely to achieve high performance where the individuals within them exercise leadership in their areas of expertise. This leadership not only involves coming up with ideas but also, as Pisano suggests, taking accountability for decisions that rely on an individual’s knowledge and expertise. Pisano suggests that teams and organisations will collaborate more effectively if each person contributes input and ideas and takes accountability in this way. What better topic to select from Daniel Goleman et al’s Building Blocks of Emotional Intelligence, as we prepare for a new year, than booklet #5 on “Positive Outlook”?! Seeing the positive in people, situations and events: being open to the idea that people might mean well, much as whatever they have said or done has come across differently. And having a mindset that something good might come out of change. Seeing the opportunity in situations. It’s also about having “dispositional optimism” (Michael Carver, Charles Scheier et al) – focusing on what is important to us, and on what we can do in a given situation. Persistence in pursuing goals: keeping focused on what is important to us, despite setbacks and obstacles. It’s also about having an “optimistic explanatory style” (Martin Seligman et al): bad things happen, but not everything will be bad, and I will deal with it somehow. Expecting the best from others – if you show people that you believe in them, then you are more likely to respond to that in a positive way. But an unrelentingly positive attitude might not always go down well! As Daniel Goleman points out, what makes for a positive outlook in America, may come across as unrealistic in Europe, or arrogant in Asia! And the obstacles to achieving something may indeed be insurmountable, or unsafe to try to overcome. So “positive outlook” is also optimism tempered with “realistic pessimism” or humility, to suit the different cultures and situations that we might find ourselves in. As the illustration above shows, a positive outlook will lead to positive emotions, which in turn will help us to be more effective in our work with colleagues and customers. Positive emotions are contagious! People who give out positive emotions will get positive emotions back from others. (Just think what happens if you smile at someone – well most of the time!) In teams this effect will lead to greater cooperation, less unproductive conflict and improved performance. These positive emotions will also lead to greater well-being and resourcefulness in our day-to-day lives. According to Richard J Davidson, the centre for having a “positive outlook” is in our pre-frontal cortex. It is what enables us, in early childhood, to reach out, learn and respond to stimuli from our parents and those around us. Apparently, mindful meditation, for instance taking time out to focus on our breathing and close out distracting thoughts, is a great way to further develop the pre-frontal cortex and so increase our capacity for having a “positive outlook”. Richard Boyatzis advocates practising visualisation to train our neural networks, as athletes do. We can practise visualising positive outcomes. We can reflect, ask ourselves and others questions in order to find the silver lining in any given situation. We can be more aware of the small acts of kindness that others do for us, and return them. As Vanessa Druskat says, teams can also create this kind of affirmative environment by looking for silver linings, and for causes for hope in their work. Yes things will go wrong in a project, or in day-to-day processes. But team members can proactively identify potential problems, solve them and gain satisfaction from what they have learnt. They can also remember their successes and keep focused on the team’s purpose. Will you develop your positive outlook in 2019? How will you do so? One of the aspects I enjoy so much about working with smaller Life Science or Biotech organisations* is the level of energy, enthusiasm and connection that every employee seems to have with their company’s purpose. The people we encounter seem to demonstrate a level of autonomy and independent thinking that is sadly so often lacking in larger organisations. When I’ve worked in and with larger organisations it’s been more common to encounter “us and them” mentalities, cynicism, a lack of connection with the company’s purpose and objectives, and a lot more bureaucracy. So I always enjoy Gary Hamel’s articles in the Harvard Business Review when he describes organisations that have found other approaches to management that mitigate the disadvantages inherent to larger organisations. In this latest article, co-authored with Michele Zanini, Hamel writes about a Chinese white goods company, Haier, that has achieved significant employee engagement for its 75,000 global workforce, by developing a “microenterprise” (ME) management model. “Haier’s empowering, energizing management model is the product of a relentless quest to free human beings at work from the shackles of bureaucracy”. Gary Hamel and Michele Zanini. 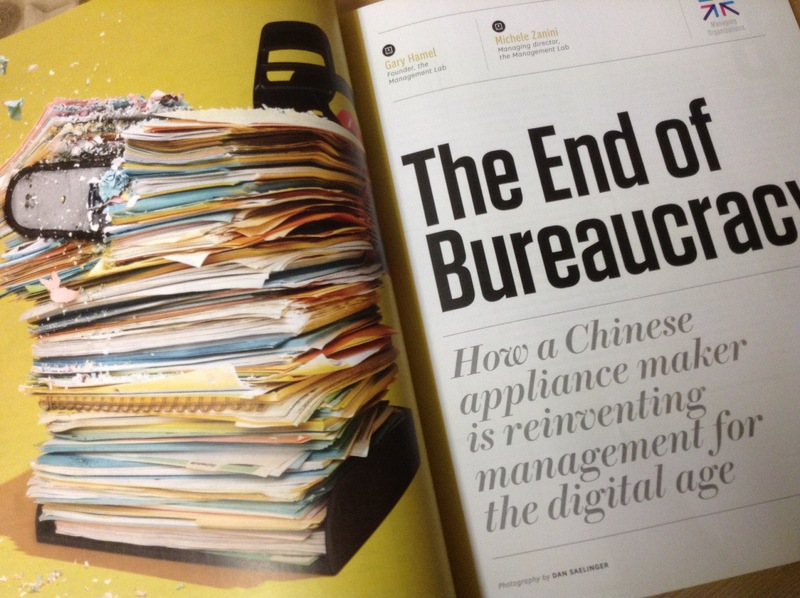 The End of Bureaucracy, Harvard Business Review, November-December 2018, pp. 50-59. Haier’s model is an extreme version of an approach that GSK trialled, whilst I was working there, with its Centres of Excellence (CoEs). In that model, there were about half-a-dozen CoEs, each with about 350 people. They set their own goals, and managed their own budgets. In Haier’s model, there are about 4,000 MEs, most of them with 10-15 people. There is a strong emphasis on autonomy, with the ME teams setting their own, very ambitious, goals, and managing their own budgets. The MEs also set their own pay rates and distribute bonuses, dividends and profits based on their performance against goals (or “lead targets”). Ultimately, employees behave and are treated more as owners and members of start-up organisations than as employees of a corporate organisation. Groups such as HR, Finance, IT, legal affairs etc. are set up as “node” MEs instead of the centralised or shared service model common to larger organisations. These node MEs have to bid as suppliers to market-facing MEs who can choose between competing support services within or even outside the organisation. Contracts or agreements are then put in place to ensure that expected standards of service are maintained. MEs can change their leaders if they are under-performing, can recruit new leaders in an internal selection process, and can accept take-over bids from leaders elsewhere in the organisation. Collaboration. Haier’s MEs were initially very competitive, and risked losing the benefits that could be gained from pooling their efforts and expertise. Haier formed “platform” MEs to address this. These platform MEs are somewhat akin to the “Communities of Practice” known to Knowledge Management practitioners. The platform MEs are of two types, one type addresses categories of product or technologies, the other addresses capability development or competencies that might cross several products. Open Innovation. Haier adopts all the practices available to tap into sources of innovation beyond the boundaries of its organisation. It invites potential users to provide input on needs, preferences and problems. It accesses a world-wide network of experts for creative problem solving and to support R&D and eventual sales and support. Intrapreneurship. As the HBR authors point out, one of the consequences of bureaucracy in large organisations is that the organisations can become very conservative. Haier encourages a start-up culture whereby employees effectively act as intrapreneurs to pitch for and launch new MEs. These new MEs are often initially externally funded, to prove their viability, before Haier pitches in with internal funds. Apparently, Haier’s resultant growth in gross profits, revenue, and increase in market value are unmatched by any of its domestic or global competitors. Zhang believes they have achieved this through their practice of rendanheyi – a tight association of “the value created for customers with the value received by employees”. As the HBR authors point out, most companies have focused on optimising their operations, and, more recently, on digitising their business models. Haier’s microenterprise approach would appear to be a unique route for achieving employee engagement in a large organisation. Could finding ways to continue to work and think like a start-up mitigate against the otherwise inevitable increase in bureaucracy, and decrease in employee engagement inherent to large organisations?